today, the Philippines will be celebrating the National Heroes' Day. we have seen heroes of our time. among the many Philippine heroes, I personally admire Benigno Ninoy Aquino Jr. (November 27, 1932 - August 31, 1983), Dr. Jose Rizal (June 19, 1861 - December 30, 1896) and Andres Bonifacio (November 30, 1863 - May 10, 1897). they were killed to stop their fight for justice. they died in order to make us realize that the Filipinos are worth dying for. today, many modern Filipino heroes arises. not as politicians or leaders but in their own small ways have brought with them the real character of what Filipinos can do for their God, for their family and for their country. mabuhay ang mga ordinaryong bayaning pinoy! photos were taken at Rizal's monument in Binan Laguna. a place where Dr. Jose Rizal, the Philippine national hero, took residence studied during his childhood days. 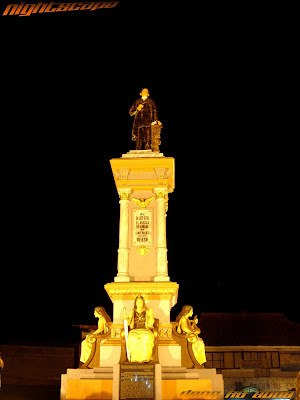 Very nice nighttime shots of Rizal's monument. The country is badly in need of heroes that will make it truly rise from its current condition. Let's hope that profound positive changes happen within our lifetime. The monument brightly honours your national hero. Wonderful and interesting night pictures. This is cute and interesting too. Those are beautiful shots of the monument. I agree with you about modern heroes who make a difference in their small ways. I see that throughout history everywhere. Often the people that collectively can make the biggest difference in each others lives are not the political leaders but the ordinary citizen. It's good to remember that while also honoring people who give their lives in a fight for justice. This was a good post for your country's National Heroe's Day. Let's hear it for the ordinary heroes! Very beautiful photo of the statues. You are good in capturing the photo in the night. What a great monument. Sounds like this guy really deserves it. my favorite hero has always been andres bonifacio. palaban kasi! hey dong, those are nice shots ;-) where exactly is this monument? hey, we have a bust of rizal in tokyo's hibiya park ;-) though i haven't seen it yet. hehehe. wow! i didn't know this statue existed. great photography as usual. What a special day! We don't have this in Singapore. There are many ordinary heroes whom we have to thank. dong add kita sa links ko. and the ordinary heroes too! i want to know how it feels being erected with a statue. hehe. They said in 1986, Ninoy said, Filipinos are worth dying for. Perfect way to remember such a special day. We should all be grateful for the ordinary heroes that we encounter in life. Rizal and Ninoy died because of what they believed in (which is opposed to the power that be). Bonifacio on the other hand was killed in a power struggle between him and Aguinaldo. What's sad is patraydor pa siyang pinatay by Aguinaldo's henchmen (same thing they did with Luna). The animosity still exist even today. Ask a Bonifacio decendant if they see eye-to-eye with Aguinaldo's family. someone (she's here!) reminded me that we are all like Phelps, a modern hero, because everyone overcame odds and swam ahead of millions of other little ones to hit the jackpot the the egg and we are here today because of that victory! We should all have monuments! lol. yeah, a lot of heroes are born but we can also be a hero on our own little ways. talagang consistent. night photos lagi. hmmm... Im thinking now, ano kaya ang work mo? I believe we can all be heroes in our own simple way..we can do little things for others. This is such a nice blog too! I love your images. the filipinos are indeed worth-dying for dom. happy national heroes day to you and to every little heroes that are saving our economy right now. this is a good tribute to our heroes dong! pero sadly, we often forget the lives and deeds of these men and women. heroes day nga pero ang dami nagbabakasyon since long weekend. Hindi ka nag-iisa, Dong. 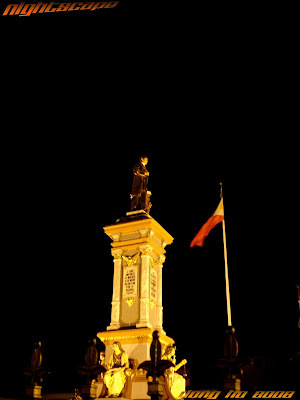 Nice shots of Rizal's monument. I admire our heroes for their sacrifices for our country. I only wish that we can make this country great again, and each Filipino be proud of his/her heritage. sa fort santiago may footprints niya. sinundan ko. feeling ko hero rin ako. As always, beautiful nightime shots. What a great tribute to a special day! yes. sobrang daming unsung heroes sa panahon ngayon. empty cans make the most noise. those politicians who scream about this or that project of theirs (the budget coming from the people naman) are not getting my respect. i have much respect to the manang who is my newspaper suki. she said earning 100 a day for "pang-kain" is enough to make her happy. happy holiday sau don kahapon. hehehe. medyo late to. hindi na kasi ako nakabalik online last night. ikaw hero ka rin. mas mganda yung mga taong gumawa ng mabuti hindi dahil gusto nila ng attention at posisyon pero gusto nilang makatulong at ina appreciate ang simple ngunit makabuluhang mga bagay. this month ba talaga ang National Heroes day? hindi ba Linggo ng Wika? he he he..
astig talaga si Pepe, kahit saan ka man pumunta merong monomento yan... at laging merong kalyeng nakapangalan sa kanya..
Great photos! I didn't know na meron palang monument si Dr. Rizal sa Binan. So nice to feel your pride and caring.